Hallelujah, nobody was sick this week! We had a very busy week planned with an orthodontist appointment, lunch with a friend, a field trip, lunch with my mom, and a meeting at church. Whew! How many of those scheduled items actually happened? Just the orthodontist. The week started out on schedule with the orthodontist, but then the friend had to cancel lunch at the last minute. Amber and I decided to go out for a special lunch anyway after an impromptu errand trip. We had a snow storm forecast on Thursday, but we have had several similar forecasts this year with very little snow arriving. This time the snow / sleet mix actually came! We even managed more snow than sleet totaling 6 inches of sledding snow, topped and based by a shiny layer of sleet. It made for very fast sledding and somewhat painful sledding if you fell nose first off a sled like Amber did. Thankfully, she wore her previous pair of glasses out sledding. The snow and sleet came too fast for the road crews, so our area had sections of the interstates closed along with many side roads. 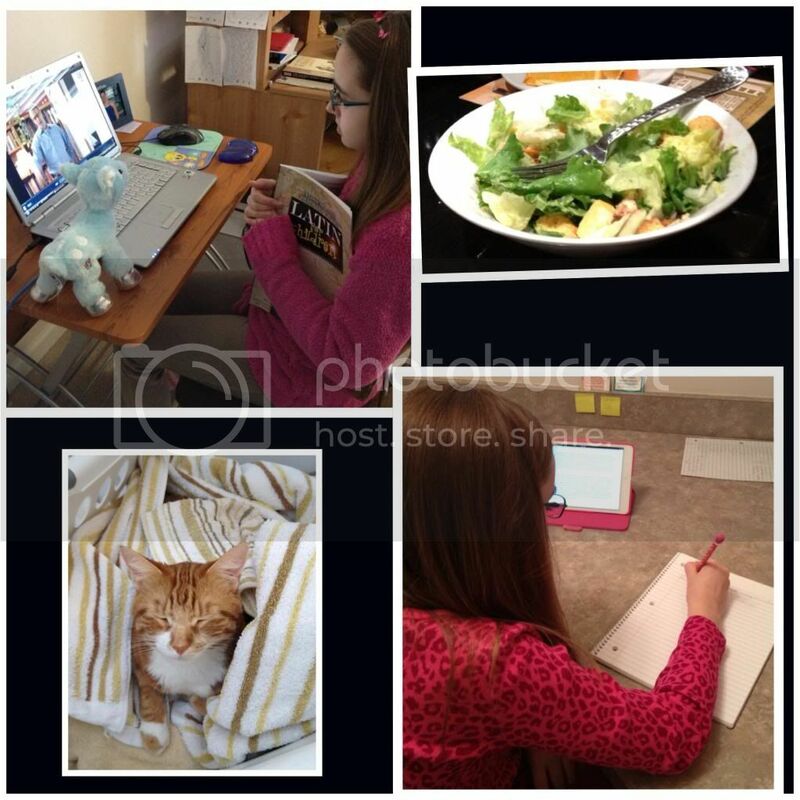 We spent all day Thursday home instead of going on our field trip. Still, we completed a few regular school subjects before the snow became deep enough to believe we might be able to sled. Unfortunately, it did sleet intermittently during the day. 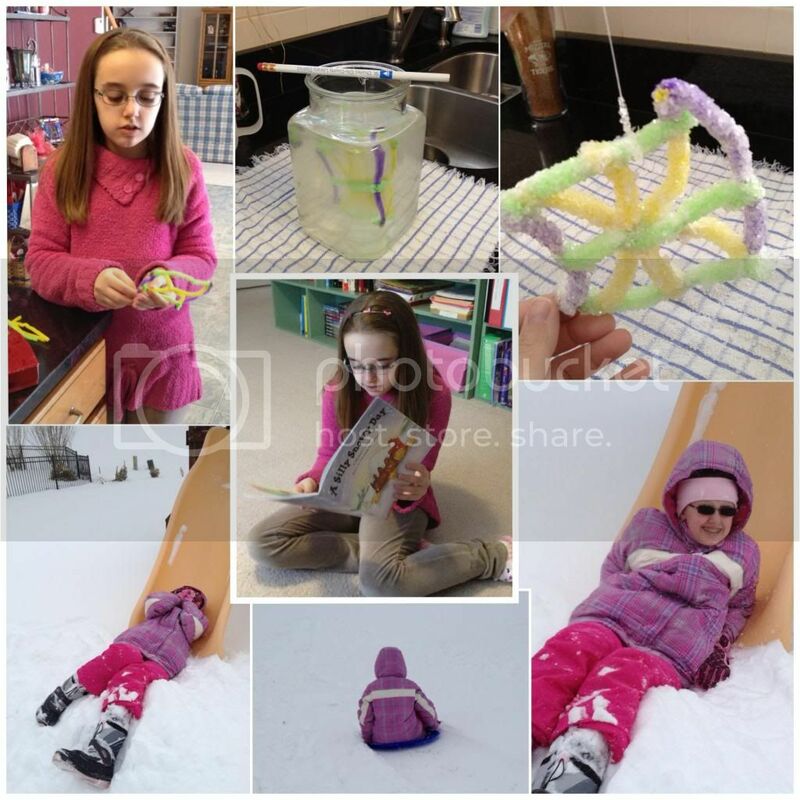 We had been waiting for such a snow day to complete two special science experiments. The first let Amber use her brand new microscope, but required me to stand out in the snow trying to catch one of the monstrous sized snowflakes on a refrigerated slide. It was worth it though so that Amber could see a snowflake up close and watch it melt. The second experiment was making a crystal covered pipe cleaner snowflake with borax. It was fairly simple and Amber immediately understood the concept of dissolving the borox in hot water molecules and then having the borax released as the water cooled. She still had a great time making the snowflake. In school studies, we have continued astronomy in science with great enthusiasm. The history topic of the Great Depression hasn't been as well received. Latin has been continuing at a much faster pace, but I realized that I never added the translation portion of the curriculum when Amber advanced far enough into this level to begin translations. She is now playing catchup with the translations as well as working through her regular lessons. (Top-R)A grilled chicken salad that Amber ordered of her own accord. Great choice! (Bottom-R) Writing with Skill. Still going well. Amber continues her literature study of Robin Hood having declared it her favorite this year. It surpassed King Arthur, Tom Sawyer, and Sherlock Holmes (even after watching a one of my old favorites, Young Sherlock Homes). High praise, indeed! I've been revamping the remaining literature studies for the year. We have decided to read Treasure Island, as Amber has a fascination with the Pirates of the Caribbean movies. She has also asked that The Hobbit be included this year. Amber has already read The Lord of the Rings trilogy, so I assume The Hobbit will not be a problem for her. I was also considering adding Oliver Twist, since Amber's musical theater class is performing selections from Oliver! I'm not sure there is time for it, or that Amber would entirely enjoy the book. I might simply recommend it as part of Amber's summer reading this year. 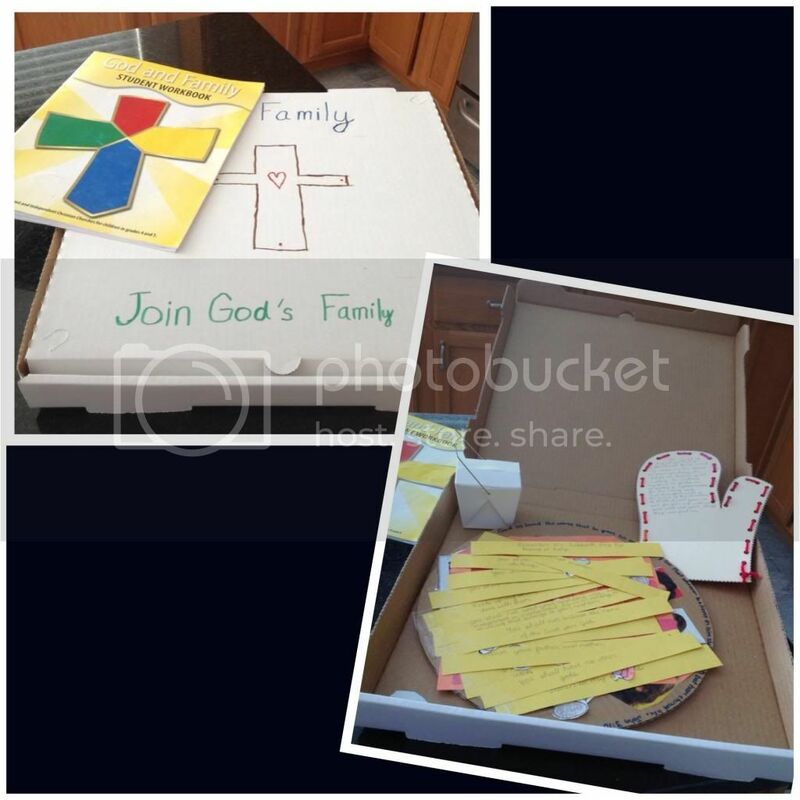 We completed Amber's God and Family book this week and she was prepared for her meeting on Friday with our church's DCE, but that meeting was also postponed due to weather. We hope to have approval for her award this weekend. 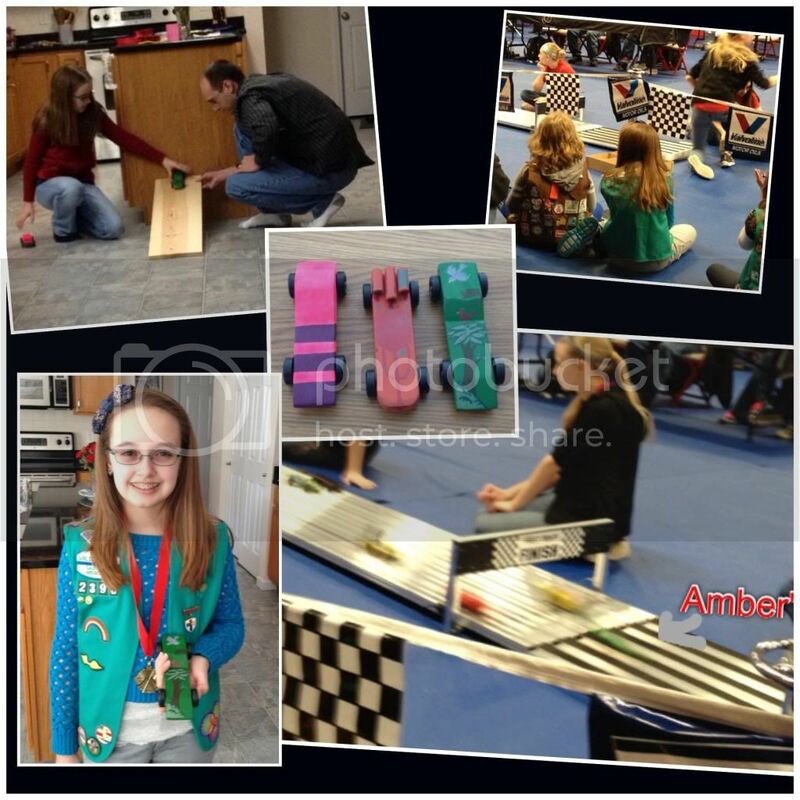 Finally, today was the Powder Puff Pinewood Derby with Amber's Girl Scout troop. She and Fred love to design and build her car each year. My entire participation in this is to remind them of the date and cheer on her car. Amber decided to decorate her car in a jungle theme this year. Amber's car took first place in all the heats it ran. She won 5th place overal out of 70 cars! Not shabby for a Friday night finish on the car. We are trying to reschedule our field trip for next week, but snow is forecast again. Amazing how we can go all winter with very little snow, but have several late February snows. 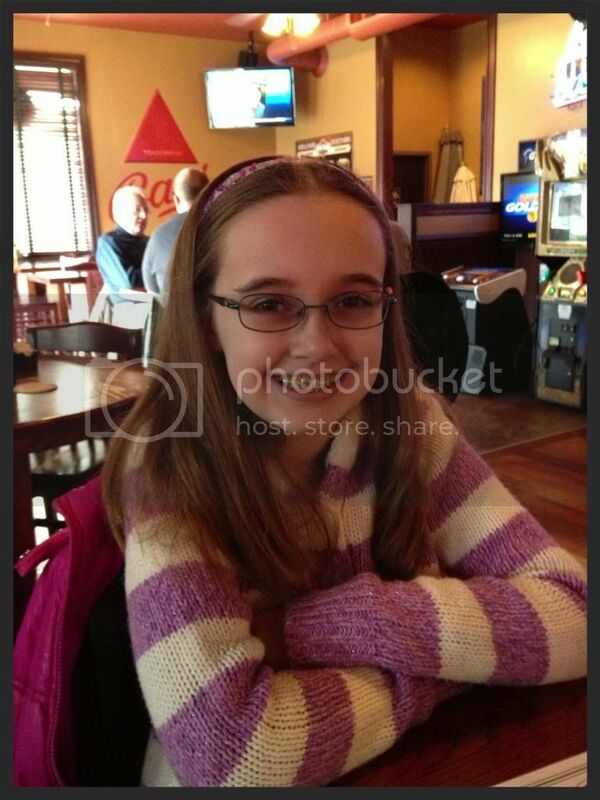 This coming week we also have Amber's checkup, and hope to get some answers there. Wish us luck this week! Christy you all stay so busy! Even with the snow you do so much. We didn't' get snow this year and I think we just aren't. Love all the snow pictures and the crystal snowflake. What kind of microscope do you have? I bet seeing the snowflake was really cool. Sometimes when Keilee just isn't crazy about a history topic I will get a movie that is based in that time period. Grapes of Wrath or something similar? Love all her cars! !